My dog, Mavis, loves nothing more than rolling around in anything that reeks. Whalon Lake Dog Park entrance. You can take the dog out of the dunes, but you can't take the dunes out of the dog. The days are sweltering and while you can cope by wearing linen or sucking down a frozen margarita at a sidewalk cafe, you have a best friend at home wearing a fur coat who has needs. And the needs are beyond heeding nature’s call. Really, your friend has the greater urge to return to nature … to feel what it was like sprinting through forests with his canine crew all those thousands of years ago before he was angling to get a piece of your discarded caribou carcass at the fireside when you were busy grunting about how the Internet wasn’t invented yet, or language, for that matter. Thankfully humans have attempted to do right by their best friends via dog parks. And these may be the closest thing us Midwestern city and suburb-dwellers have to giving our furry friends what they so desire. Below is a survey of great places outside of Chicago to go to very literally unleash your city dog’s inner country dog. Take note: before you venture out to these dogtopias be sure your pets are up to date with all vaccinations and pay special attention to the permits/cost section. Some spots make it difficult to be spontaneous as there’s no way to secure a permit on site. I chose the following spots based on their size (bigger the better), relative accessibility to Chicago, geographic diversity (one for every direction) and the fact that they’re off-leash (all but one). Know that there are additional off-leash areas and this is just a survey of a few. If you have other parks to recommend, please comment below! If you’re inclined to be thorough, use our guidelines for the benefit of others (Name, Location, Size, Hours, Features, Permits/Cost, More information). Also: if you’re all like “what about off-leash areas in Chicago?” Well the Chicago Park District site has you covered. Below is all about adventuring outside the city limits. And if you don&apos;t have access to a car, all hope is not lost! Many rental companies do allow pets but there are guidelines. Click here for more images of some of these parks. FEATURES: There’s little something for everyone here. Lots of water for the dogs (no swimming for humans), a tame, crushed gravel path you can take on with flip-flops as well as wilder options where boots would be better: off-roading field adventures on footpaths and in tall grass. There are benches for resting, too. But beware if you have a dog that has selective hearing when you call it back: there is no fence on this preserve. Best to bring dogs that don’t have a tendency to take off and leave you out of sight. PERMITS / COST: While daily permits are available at $8 a day for DuPage County residents and $20 a day for non-residents, you have to secure them in advance either by filling out online forms or visiting their Wheaton office. Annual permits run $40 for residents and $8 for each additional dog; $150 for non-residents and $25 for each additional dog. After September 1st, there’s a price break through the end of December. For more information: Contact their Visitors Services: 630-933-7248, forest@dupageforest.org and check regulations here. FEATURES: Prairie Wolf is my dog’s favorite place on earth (so far). It’s fenced in but expansive enough that you don’t even notice. There are additional enclosures within for training and small dogs as well as crushed gravel trails, mowed grass trails, footpaths, a decent bathroom, drinking fountains for dogs and humans, ample field space for ball or frisbee chasing and a swimming pond (for dogs). It’s really well maintained, and I can attest it’s magnificent in all seasons (see photo set for proof). PERMITS / COST: Spontaneity level high! Prairie Wolf has daily permits available right in the parking lot (cash or check accepted). It’s $5 for Lake County residents and $10 for non-residents. Annual permit pricing: Lake County residents $44 for first dog, $18 each additional dog / Non-residents $120 for first dog, $56 each additional dog. (Psst: after September 1, fees are cheaper for annual permits and last through December 31). Purchase annual or daily permits here. For more information: Lake County preserves info here or call 847-367-6640. FEATURES: This park is great for dogs with a fetch fetish. Whalon features big, open grassy fields with a touch of brush and trees, so it’s fairly easy to find the frisbee or tennis ball you’re whipping around. For small dogs there’s a 1.9 acre area they can roam free and feel safe from their bigger brethren. There’s also a shaded structure with benches to take a breather as well as drinking water. Bring your own dog bowl though - there’s no easily accessible water on the ground for your pooch. And there is a bathroom for you if you’re hitting the water bottle hard. PERMITS / COST: You’ve got to plan in advance - no permits are available on site but you can apply for permits at a few Will County towns and a pet store as well as obtain forms online to mail in. Daily permits are $5 for both Will County residents and nonresidents but the annual fees vary. A Will County dog costs $40 per year, a non-Will County dog is $80. The pricing structure has some more complexity depending on the number of dogs, your age, and time of year - there are price cuts starting October 1. Visit this page for full details. For more information: Permits and other county dog parks info here or call (815) 727-8700. 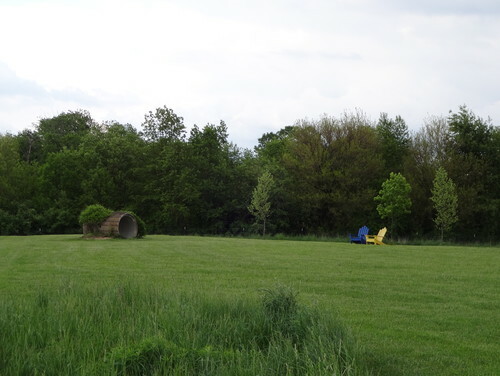 FEATURES: This fenced-in field located on farmland offers a “green” experience with a solar water well and biodegradable materials like benches made from salvaged oak trees, recycled rubber mulch and biodegradable dog waste bags. There’s a sand bunker for dogs devoted to digging, and a shelter and benches for relaxing protected from the elements while your pup sprints circles around the open field. Freedom Bark Park also has an enclosed three-quarter acre area for small dogs to schmooze. Drinking water is available for pets and owners. PERMITS / COST: There are no daily permits here as the park has a key entry. Year memberships are $60 for residents of Lowell and $70 for non-residents. It’s $5 for each additional dog after the first regardless of residence. Note: price break after July 1st - membership is half price for everyone until December 31st. For more information: Check their website or call the Park Department Office at (219) 696-1570. Looking for a good excuse to get way out of the city, then try these trips: one to the Southern Wisconsin (near Lake Geneva) and the other along Michigan’s lovely great lake’s shore. 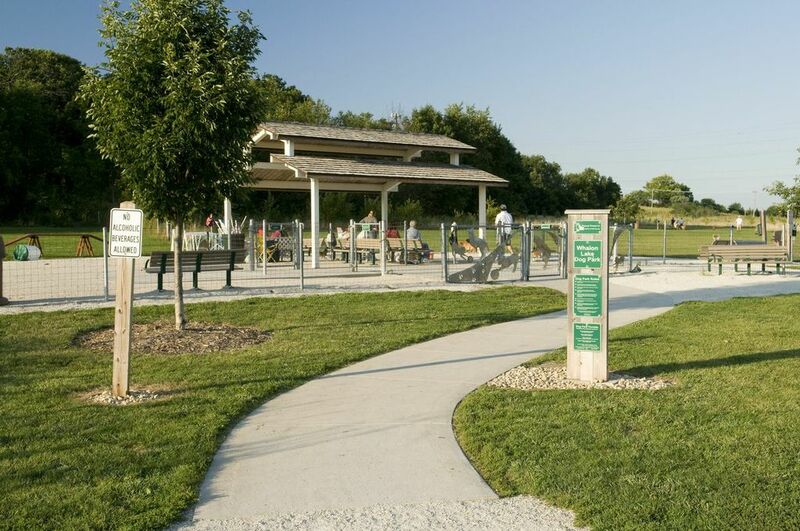 FEATURES: No fence here, but the miles of mowed prairie trails help keep your pup in sight. This part of Wisconsin is idyllically hilly having not been ironed out by glaciers, so sweet views abound and you’ll get a nice calf workout on the gentle climbs. Birdwatchers - bring your binoculars: Henslow’s Sparrows, Wood Ducks, Kildeer, Bobolinks, Eastern Meadowlarks and more nest here. And if your canine fears equines or loves to roll in their you-know-what, keep an eye out as horses are known to trot and plop here, too. There are benches for resting and a few gurgling creeks if your dog needs to take a dip or sip. Bring your own poop-bags and a bottle of water for yourself. PERMITS / COST: Apparently free! For more information: Not much online, but you can read about the park’s history and goals here. FEATURES: Grand Mere is the Rolls Royce of dog parks, that is if your dog is into water and sand. But beware - on really hot days the scorching sand can burn your pooch’s paws! The shoreline is a three-quarter mile walk from the parking lot area and you’ll have to negotiate a sand dune to get there. Also of note: the official policy is that dogs need to be on a six-foot leash and under “immediate care” - meaning your hand has to be attached to the dog in the water or not. Should an officer see you disobeying the policy, you may be fined or issued a citation. It’s BYOB (bring your own bag) so come with your dog doo supplies. There’s additionally some shaded trails and inland lakes worth a stroll. PERMITS / COST: For all Michigan state parks - if your vehicle is not registered with the state it’s $8.40 for day permit and $30.50 for the year. Permits can be obtained at the nearby Warren Dunes State Park on your way to Grand Mere. 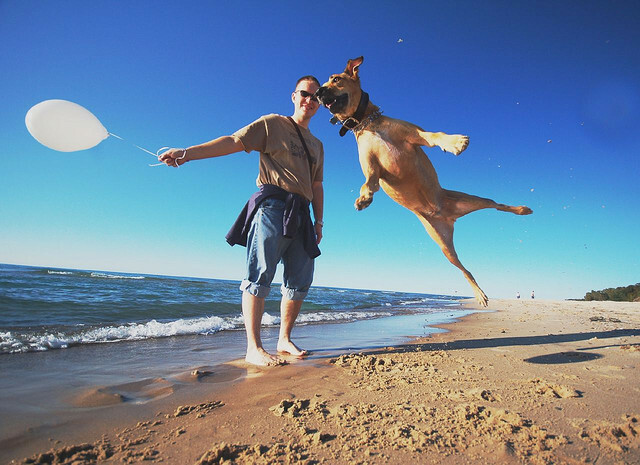 There’s also a pet-friendly stretch of beach at Warren Dunes, too if you want a twofer. For more information: More parks information at Michigan’s DNR site or call (269) 426-4013.